Q. How long will my balloons stay inflated for? Q. How many balloons will my helium cylinder fill? Q. How do I correctly use my helium cylinder? A. Our cylinders come in two different types, depending on size. 1. Screw the inflator firmly onto cylinder valve outlet in a clockwise motion. The inflator must be screwed in until hand tight. 2. Open the cylinder valve by slowly turning the hand-operated valve on the top of the bottle anticlockwise. 3. Put the neck of the balloon over the rubber nozzle, hold the balloon firmly and gently pull the nozzle backwards to inflate balloon. Release when desired size reached, remove balloon and tie knot in balloon. N.B If using twitchets or stoppers, ensure the pointed end is attached and twitchet is entered into balloon before inflating. 4. Close the cylinder valve when balloon filling is completed by turning hand wheel clockwise. Then purge remaining pressure from the valve by pulling the inflator back as stated above. 5. The inflator should now be free to unscrew, and may now be returned with the cylinder. Note, the inflator will not unscrew unless the pressure has been released. The N- Bottles come with a gauge that will allow you to monitor your helium use as you inflate your balloons. For example, when you have used a quarter of your helium you can check how many of your balloons have been used. If you have used more than a quarter of them then it is likely that you are inflating the balloons too large, and can readjust your inflation size. Similarly, if you have used less than a quarter then it allows you the opportunity to increase the size of some of your remaining balloons should you wish to. Please ensure the gauge is showing ‘full’ when you receive the cylinder. 1. Snap the inflator into the cylinder. 2. Open the cylinder valve by slowly turning the hand operated valve on the back of the bottle anticlockwise. 5. The inflator should now be free to remove, and may now be returned with the cylinder. Pull back on the connection where it joins to the cylinder and remove. Note, the inflator will not unscrew unless the pressure has been released. Please read, understand and observe the safety precautions on the cylinder neck label and the warning on the side of the cylinder. Do not place cylinder where it could come into contact with an electrical circuit. Do not use cylinders as rollers. Do not allow cylinders to drop or strike together violently. 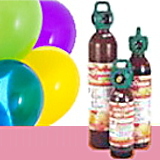 Do not allow anyone to breathe helium from cylinders or from filled balloons. Helium is an asphyxiate. Do not transport the cylinder with the inflator attached, as this will likely cause damage and will be charged for. Q. How long do I get to keep the cylinder for? A. A collection date will be agreed before the cylinder is dispatched but the free hire on the inflator and cylinder is six days from the day the package is received. A charge of £8.58 per month or part month for the cylinder and £2.00 per week for the inflator will be applied for rental beyond the six days. Q. Where can I use my helium cylinder? A. The helium cylinders can be used in most public places but in all cases it is advised that you contact the venue prior to ordering your cylinder to confirm this. The N-Bottles have the necessary health and safety printed on the side of the cylinder should this be required. Q. How does a balloon race work? A. 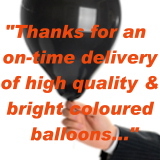 A balloon race is an excellent way for schools, charities and other organisation to fundraise. 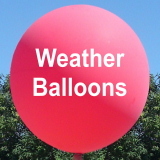 In the case of a school, for example, staff, pupils and friends of the school are given Balloon Race Labels to sell. These are stamped with the name and address of your school. The buyer will write his/her name in the appropriate place on the label. On the day of the event the labels are attached to helium filled balloons which are then released from the balloon net. Each balloon label has a request that the finder should post it back to the school. Prizes are given to those people whose balloon labels are returned from furthest away. Q. How long will it take to blow the balloons up? A. A team of three people can blow up approximately 150-200 balloons an hour. Q. How much do I sell the tickets for? A. You can sell the tickets for as much or as little as you like, but most Balloon Race labels are normally sold for £1.00. This will also depend on what prizes are on offer and how many labels each pupil is given to sell. Q. How do I get people to buy the tickets? A. It is important to start selling the tickets early. A good 1st prize will encourage people to buy more tickets, and it is always a good idea to offer a prize to the person who sells the most tickets. Contacting the local press to raise awareness of your race will also increase ticket sales. A. 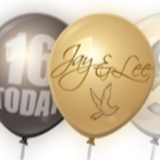 All of our balloons are 100% biodegradable latex and our race labels made from paper. It is important not to use string, ribbon or twitchet valves, all of which are not environmentally friendly. 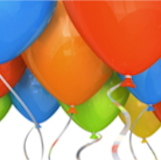 For releases of 5000 balloons or over, you will also need permission from the Civil Aviation Authority (CAA). 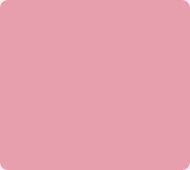 The CAA can be contacted on 020 7453 6599, and requires at least 28 days notice.